Time flies and I still haven’t figured out how to do things I used to do, but when I’m holding my little baby, I don’t seem to mind. I do want time to myself, but I don’t want to waste my time with her. I just know that she’s going to grow up so fast! She’s 15 weeks old now. So what’s happened lately? Her second trip to Disneyland, first time on Pirates! Jerrod’s mom was visiting. Here she is with my 3 year old cousin on my sister’s birthday. Guinevere’s first 4th of July! 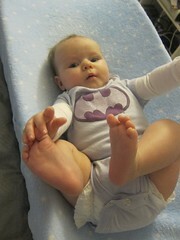 This entry was posted in Home, Journal and tagged baby, Guinevere, pictures on July 8, 2011 by Shannon. So I had my nonstress test this morning and due to her lateness and my relative readiness they sent me right over to be induced. I’m in my room now and on a pitocin drip. The midwife checked me and swept my membranes, taking me from 2 to 3cm dilated. I am having contractions but they don’t hurt yet, they’re just uncomfortable. I was apparently having them before but I just thought it was the baby moving and pressing up against me. Jerrod has learned to read the machine. I have been praying for the right caretakers and when I told my nurse that my dad works at Biola she said that her son went there and is now at Talbot. She also told me that she always prays for her patients before work, so pretty good. Now I’m just trying to rest. 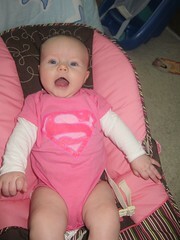 This entry was posted in Journal and tagged baby, birth, Guinevere on March 21, 2011 by Shannon. 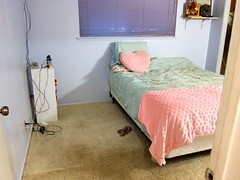 We live with my grandmother and had been living in one room with our bed and our desks and computers. 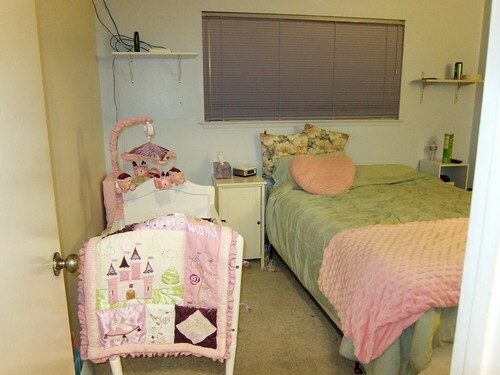 We have moved into a room that was the “computer room” as our bedroom with the baby, and we are leaving our desks in the first room. 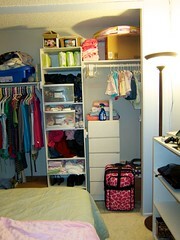 The transformation from bedroom/office to full office isn’t quite complete, but our bedroom/nursery is pretty much done. 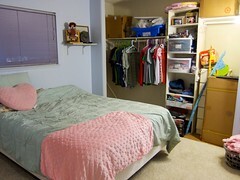 Some “before” pictures. 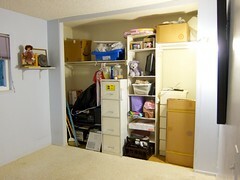 It’s too bad I didn’t think to take pictures before the room was cleared, but it’s still a big contrast. 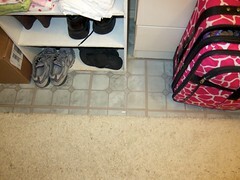 Icky, dirty, scary old tile on the closet floor. 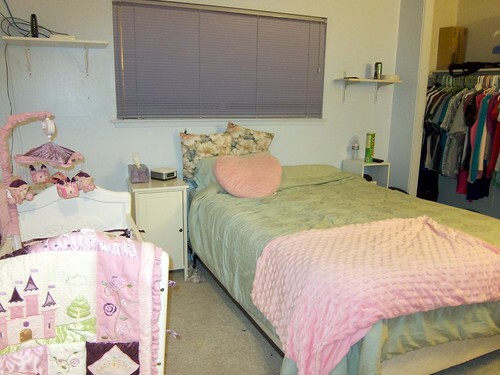 Transitioning – our bed is in the room and some of our stuff in the closet. 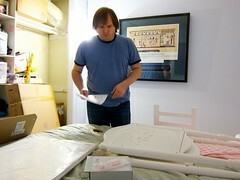 The cradle assembled, and with the mobile attached. 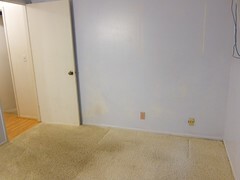 The room is painted blue, and the paint on one of the walls was especially bad. 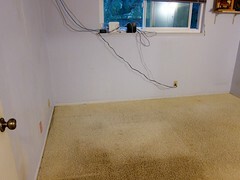 You can see how bad in one of the “before” pictures. 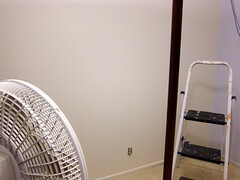 My mom painted that wall white. 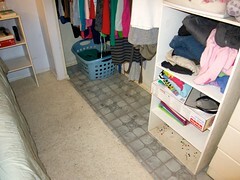 We also covered that scary old dirty tile in the closet with some vinyl tile. 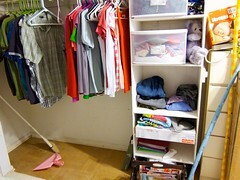 A close-up of the new closet floor and that bottom shelf is now clean and storing shoes. 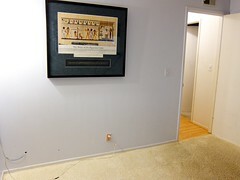 We also replaced the cubit stick posterwith a tv. 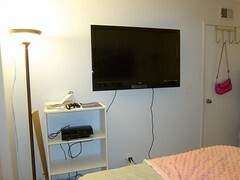 It’s not hooked up to any cable or anything, the tv has built-in apps like Netflix streaming and our PS3 is hooked up, providing games, media streaming over our network, and of course blu-ray playing. Cradle with the bedding. It’s Kidsline Rapunzel. Yes, I know I can’t leave the quilt there when the baby is in the cradle. And that’s pretty much it! We got a new nightstand for me (Ikea HEMNES nightstand) and Jerrod got that little shelf I’d been using on his side. The cable modem and router had to stay in that corner, so we’ve got it on a mounted shelf now. 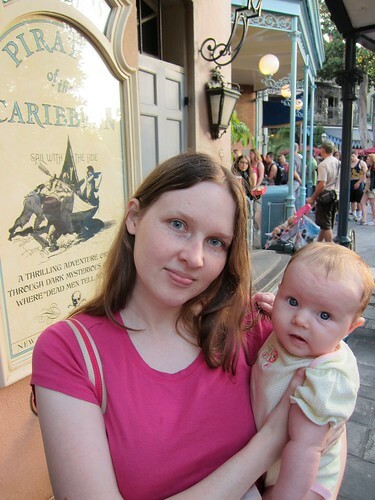 This entry was posted in Home, Journal and tagged baby on March 7, 2011 by Shannon. 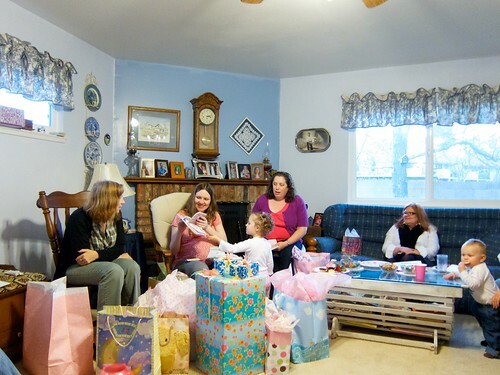 The baby shower was two weeks ago. I just realized it was two weeks ago, I was thinking it was one! 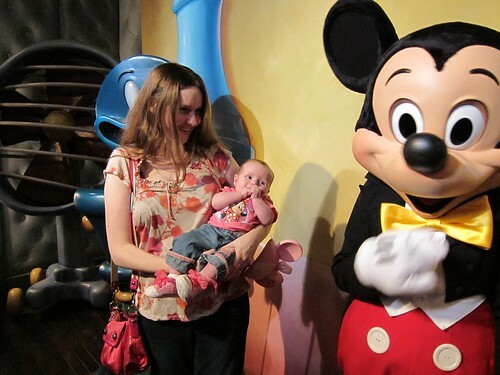 It was wonderful and Guinevere got so many adorable little outfits. She won’t need anything new for the first six months at least! 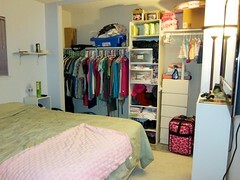 Check out the whole album of pictures. We live streamed the shower too. If you missed it, here’s the video. Be warned though, this is the full unedited video of the stream. 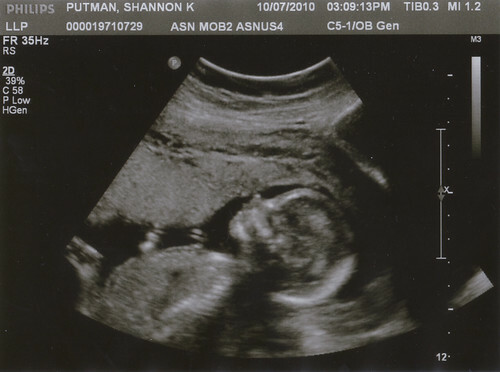 This entry was posted in Home and tagged baby, pregnancy on March 6, 2011 by Shannon. Here’s Guinevere at 37 weeks. 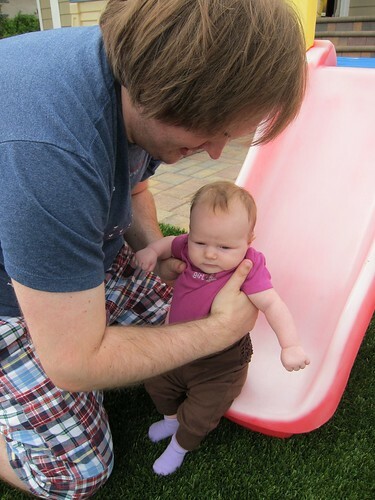 Her head was already pointed down and she was at just the right size for her age. 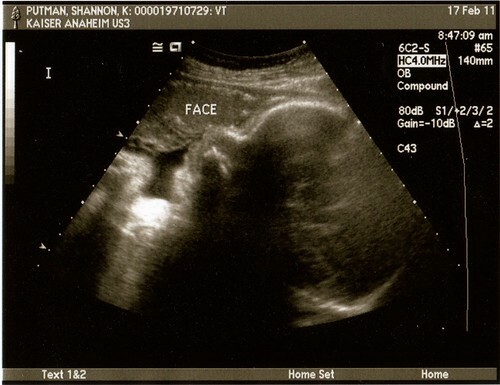 This entry was posted in Home and tagged baby, ultrasounds on March 6, 2011 by Shannon. We went baby shopping today. My aunt Melodee works at a baby store called Bergstroms, so we went with her and my mom to look at some of the bigger items we’ll need. 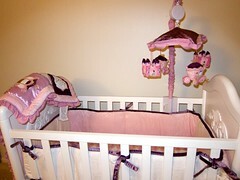 We’re not ordering a crib yet since we’re still living with my grandmother. 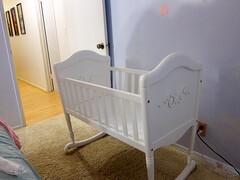 We are getting this cradle, the Chloe cradle in white. 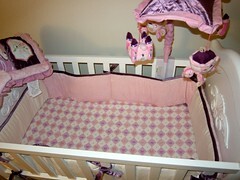 I already have the KidsLine Rapunzel bedding for the cradle. 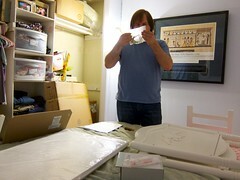 I had already decided about the cradle, but we hadn’t actually seen it in person, so we looked at it. We really needed to look at and try the strollers and car seats. I had a few in mind to look at and we ended up both liking the same one best. We’re getting the Bumbleride Flyer and I picked the Vita color scheme. It lies down flat for when she’s tiny and the foot rest thing folds up so I don’t even feel like I’ll need the bassinet attachment. The handlebar swivels so the baby can face me or face front, and it’s pretty easy to fold and unfold. The stroller goes to 45 pounds, so that should pretty much last until she doesn’t need a stroller anymore. I really like this color scheme because it’s pink on the sides but it’s a nice medium grey where the baby goes. I like that because it’s a good neutral background color which should go well with any outfit Guinevere might be wearing. I don’t like white or black because I think they get messy too easily, plus I think much black is too strong for a baby. I’ve decided that grey is my current neutral of choice. The car seat we chose is a Baby Trend. It’s not too heavy but goes to 30 pounds or 30 inches long. Jerrod had a really easy time snapping it in and out of the base, and he even strapped the doll into the seat. This is the best color scheme I’ve seen on a car seat. It’s that nice medium grey again and a great purple accent. 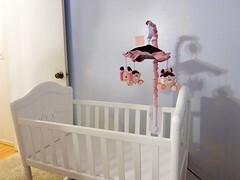 I can just imagine her going home pictures in this car seat, and how nicely she will stand out against the background. 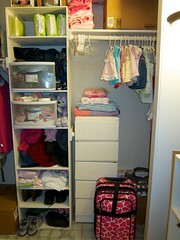 This entry was posted in Home, Journal and tagged baby, shopping on January 16, 2011 by Shannon. I started to write this yesterday, but got distracted and never finished. 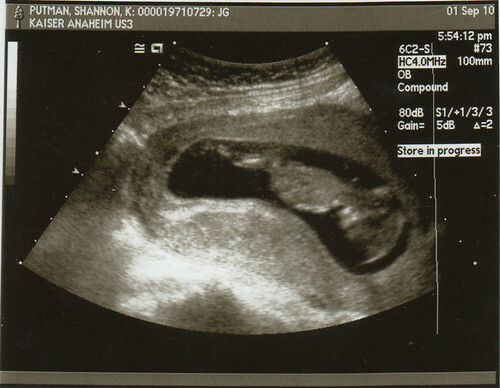 We had our “survey” ultrasound Thursday and, without beating around the bush, it’s a girl! So we’re having a Guinevere, not a Theodore. We got lots of great ultrasound pictures, including one where she’s sucking her thumb. Jerrod was amazed at how much she really looks like a baby compared to the last ultrasound. We also found out that my due date was changed from the LMP estimate(March 14) and it’s now March 10. I thought I was in week 17 but I was 18 weeks to the day. I’m a bit of a name enthusiast, so I’ve had my names picked out for a while. Now that I’ve registered her domain name, I feel safe sharing that the name is Guinevere Katherine. My middle name is Kay and my mother’s name is Karin Kay. Kay is a derivative of Katherine and so is Karin so it’s basically after my mom and I. Guinevere means fair/fair one/fair lady and white, smooth. Katherine means “pure”. 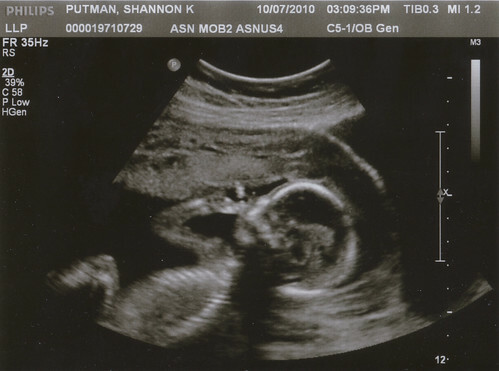 This entry was posted in Journal and tagged baby, pregnancy on October 9, 2010 by Shannon. I had my first real ob appointment yesterday morning. I didn’t realize I would need to give a urine sample and was not prepared for it. I guess I’ll need to give one every time so I guess I’ll have to drink alot of water before the next appointment. The only doctor I could get a sooner appointment with was a man, and I was pretty nervous about seeing a male doctor for this but I liked him. He was very unintimidating and friendly and the internal stuff was really quick, which is what I was most nervous about. 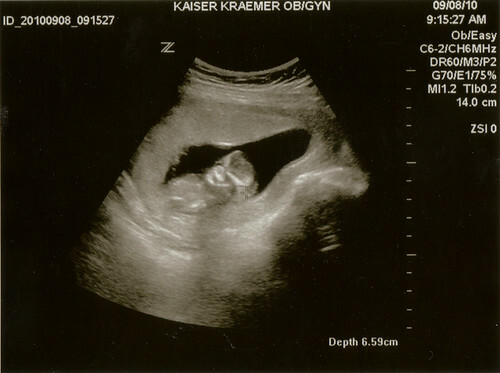 He did do another ultrasound even though I had a separate one just last week, so that was exciting. In our new picture you can see the baby’s face. I got to get dressed and we talked to the doctor in his office at the end of the appointment, and I noticed he had an iPhone so I told him about our games Sheepstacker and Word Monkey. He told us that he has a son who is a web designer, a son who is a musician, and a son who is an actor. He said it was okay to take my gummy bear vitamins and gave me an extra iron supplement, which he said I was just starting to need anyway. He also said I could have herbal tea which I’m excited about. 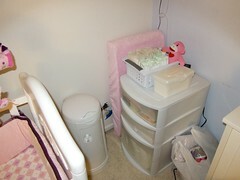 This entry was posted in Home, Journal and tagged baby, pregnancy on September 9, 2010 by Shannon. If I’ve been quiet lately, it’s partly because I’ve been withholding information. We had an exciting weekend telling the family that we’re expecting our first baby in March. We told my parents on Friday night, and the rest of my family on Sunday after the draft for our family fantasy football league. I wrote everyone notes like “Due to your exemplary performance in the role of Grandmother, you will be upgraded to Great Grandmother.” It went pretty well. I think my parents are still processing it a bit, especially my mom, and I’m not sure it’s sunk in for my sisters yet either, but Gramma, aunts and uncles were all really excited. Since my grandfather died last month, we definitely had some mixed feelings, and while he was in the hospital I was very sorrowful that my child would not know him. 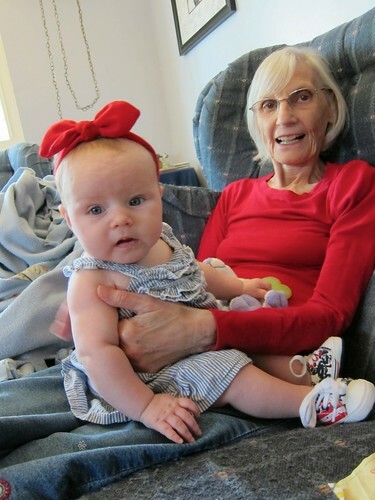 I came to realize though, that this was God’s planning and his unique timing to give my family a new joy, especially my grandmother for whom this will be her first great grandchild. We had an ultrasound last week, here’s the evidence. The baby is diving downward, so the head is on the right. It was way cooler to see the ultrasound than I expected. We were excited to see the baby and everything, but I didn’t know what it would be like to see it moving around. The still picture really does not do it justice! On the screen we could see it moving around ALOT. It was doing flips and turning around, we could see its spine at one point, make out its arms and legs, and it even “looked at the camera” once. 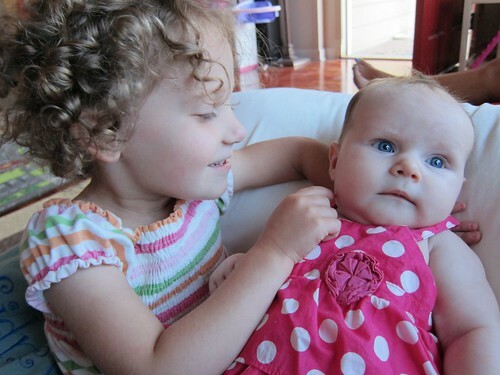 This entry was posted in Journal and tagged baby, pregnancy on September 7, 2010 by Shannon.